America Revealed: Inside the GOP's "Security Act"
Is that vague enough? Huffington Post's Daphne Eviatar thinks the bill will "authorize the use of military force domestically, if terrorists are found here at home." But, who knows? In any event, President Barack Obama did not request these extraordinary powers, so it's unclear whose interests are being served. Did Rep. McKeon concoct this bill himself in order to make the country safer or is he merely acting in behalf of powerful constituents who want a more autocratic form of government in the US? It's impossible to know, but it's odd that a Republican congressmen would want to expand presidential powers when a Democrat is in the White House. We are writing concerning certain troubling provisions in H.R. 968, the Detainee Security Act of 2011, which we understand are likely to be considered as part of the National Defense Authorization Act (NDAA) of the Fiscal Year of 2012. Whatever one thinks about the merits of the Detainee Security Act, it is a serious enough departure from current counterterrorism policy and practice to merit consideration apart from the NDAA. Accordingly, we request that you use your chairmanship in the House Armed Services Committee to immediately hold hearings so that the public can further consider the various provisions within the Detainee Security Act. "Among the many troubling aspects of the Detainee Security Act are provisions that expand the war against terrorist organizations on a global basis. The Authorization for the Use of Military Force (AUMF) of 2001 was widely thought to provide authorization for the war in Afghanistan to root out al Qaeda, the Taliban, and others responsible for the 9/11 attacks. That war has dragged on for almost ten years, and after the demise of Osama Bin Laden, as the United States prepares for withdrawal from Afghanistan, the Detainee Security Act purports to expand the 'armed conflict' against the Taliban, al Qaeda, and 'associated forces' without limit. By declaring a global war against nameless individuals, organizations, and nations 'associated' with the Taliban and al Qaeda, as well as those playing a supporting role in their efforts, the Detainee Security Act would appear to grant the President near unfettered authority to initiate military action around the world without further congressional approval. Such authority must not be ceded to the President without careful deliberation from Congress...."
The Detainee Security Act eliminates any process under which prisoners captured by the US military can establish their innocence. If you're caught by the military, then you're guilty; it's as simple as that. Conyers again: "The Detainee Security Act would also make permanent current transfer restrictions on Guantanamo detainees, further undermining the ability of the President to close the offshore detention facility." So, if the bill is passed, Guantanamo Bay will stay open forever and prisoners will continue to be deprived of due process. 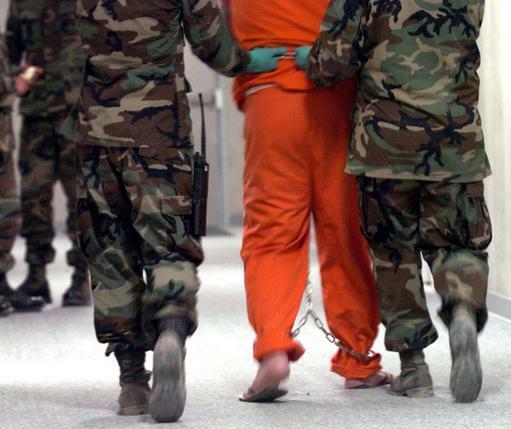 Naturally, putting the military in charge without congressional oversight increases the likelihood that detainees will be tortured or abused as they have been in the past. The real aim of the NDAA is to eviscerate the power of congress. It limits congress's power to restrain the president or to reign in the military. It enshrines the principle that the president can declare war by himself without getting a green light from congress. Thus, congress becomes a ceremonial institution stripped of any real political power. The NDAA also includes other controversial provisions that are part of the right wing "wish list." For example, the bill would give "the Secretary of Defense the authority to conduct clandestine cyberspace activities in support of military operations." In other words, the military will continue to expand its spying, hacking and propaganda programs in and out of the country. But the main objectives of the new bill appear to be pretty straightforward: emasculate congress, savage the rule of law and elevate the executive to supreme leader. Then again, that's what the GOP has always wanted, right?